Home / Modern Pest Blog / What Insect Sting Hurts the Most? What Insect Sting Hurts the Most? 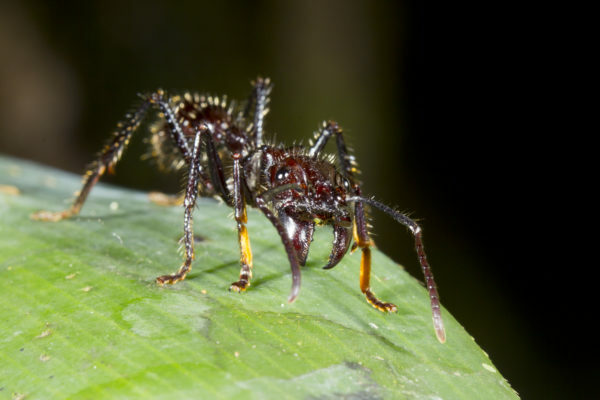 A bullet ant in Ecuador. Level 4 on the pain index. Entomology is the study of insects, and Modern Pest employs several highly-skilled entomologists. They train and advise our Service Professionals so they can be experts in the field. Entomologists study insect environments and behaviors, and entomologist Justin Schmidt has become an expert on one particular insect behavior: stinging. Schmidt works at the Carl Hayden Bee Research Center in Arizona and has published several papers about the stings of hymenopteran (an insect group that includes wasps, bees, and ants). He also claims to have been stung by most them. 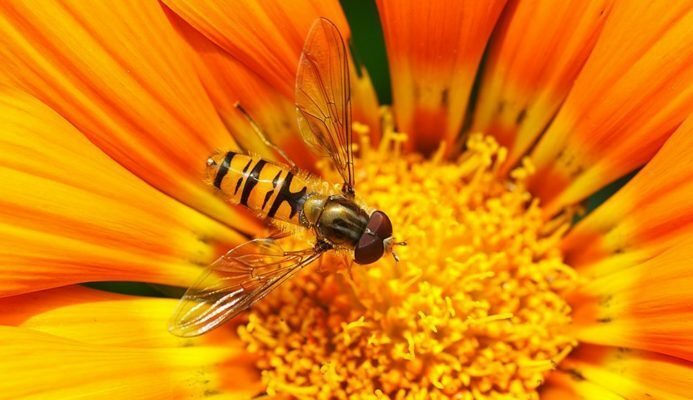 Are you having an issue with sting insects at your home or business? Call Modern Pest today at 1-800-323-PEST to schedule service! In 1983, he created the Schmidt Sting Pain Index, a scale that rates the relative pain caused by different hymenopteran stings. He categorized the stings by rating them from one to four. Schmidt started thinking about his scale while working as a chemical ecologist and studying interactions between insects and their environments. His fieldwork involved collecting different species, which also meant plenty of chances to get stung. He was fascinated by the defense mechanisms of wasps, bees, and ants. “It occurred to me that while the venom could be analyzed, it was harder to make comparisons between the type of pain each insect caused, which seemed crucial in understanding how and why different types of sting had evolved,” Schmidt said. Schmidt took it upon himself to rank the pain caused by different insects. The most aggressive insects with the most powerful stings tend to live in areas with the highest number of fierce predators. To test this, Schmidt would rate the pain and write a description whenever he was stung. Over the last 35 years, Schmidt has been stung by 150 species of insects. He still updates his pain index when he’s stung by a new insect. The study was recently published in full for the first time. Far different from these mild stings are the Level 4 attacks of the bullet ant, tarantula hawk, and warrior wasp. Schmidt considers these the worst. “Level 4 you don’t want to know,” Schmidt said. New England residents are no strangers to insect stings, either. Yellowjacket wasps and other stinging insects in New England are most concerning to humans from August through October. By then, a colony can contain thousands of wasps that will aggressively defend their nest from intruders. Their large populations also scavenge for human food at barbecues, campsites, fairs, and other outdoor activities this time of year. Yellowjackets are easily provoked and can sting multiple times. They are responsible for 70% of stings in North America and will even chase their target for large distances. Even the vibration from a lawnmower in a yard can incite them to attack. Honeybee: Like a matchhead that flips off and burns your skin. European hornet: Like a matchhead that flips off and burns your skin. Bald-faced hornet: Rich, hearty, slightly crunchy. Similar to getting your hand mashed in a revolving door. The most painful sting you could receive in the New England-area is that of a paper wasp. Schmidt ranks it a Level 3 on the pain index and describes it as: “Caustic and burning. Distinctly bitter aftertaste. Like spilling a beaker of hydrochloric acid on a paper cut.” Considering how bad that sounds, it’s almost impossible to fathom a pain level 4 sting. Justin Schmidt’s experiments with insect stings are interesting to read about, and his pain descriptions are certainly funny. But it’s not an experience you want to have in your home. Modern Pest’s Homecare Green program protects against 60 common household pests, including carpenter ants, mice, pantry pests, flies, and of course, stinging insects. So, leave the pain index to the pros, and stay safe inside your home with Modern Pest. Call Modern today at 1-800-323-PEST for a free quote or to schedule service.